You will find many fresh cauliflower recipes that soon will become family favorites. From cauliflower soup, sides, casseroles and even how to roast cauliflower - there's a little bit of everything below. Keep cauliflower in the crispy drawer of the refrigerator in an open or perforated plastic bag. Do not keep beyond four days, and do not wash until you are ready to prepare them for your cauliflower recipes. Cauliflower curds should be kept stem side up to prevent moisture from gathering on the florets. Pre-cut florets should be used within one day of purchase. Cauliflower can be eaten raw. Cut away the main stem and separate florets before washing. Cauliflower curds should be separated; they can be cooked whole in a cauliflower recipe but this requires longer cooking times, which result in the loss of nutrients. Rapid cooking is the best to prevent nutrient loss and to preserve the texture and color. Avoid aluminum pots when cooking cauliflower because they enhance the cabbage-like cooking odor created by these vegetables. Cauliflower is an excellent source of vitamin C. Cauliflower is white because it lacks chlorophyll since its large leaves prevent sunlight from reaching the vegetable while it grows. These facts are courtesy of wholefoods.com. Now on to my cauliflower recipes! If you want to learn how to cook cauliflower, you must make this. PREHEAT the oven to 400 degrees and grease a large casserole dish with a lid. Toss together the olive oil, parsley and garlic in a large bowl - add the cauliflower and mix well. Season with salt and pepper. Pour into the prepared casserole dish. Cover and bake for 25 minutes; stirring half way through. Uncover and sprinkle with bread crumbs and parmesan cheese; broil for 3-5 minutes until golden brown. Remove the stem and leaves of the cauliflower head; wash and pat dry. Spread the butter all over the head of the cauliflower, sprinkle with seasoning salt and finally the parmesan cheese. Wrap the head in heavy duty aluminum foil and bake for 1 hour. You may also put this on the grill for approximately 40 minutes. In a stockpot add the chicken stock, potatoes, cauliflower, carrots, onion and garlic. Bring to a boil and simmer for 15 minutes or until the vegetables are tender. Remove from the heat and cool for 15 minutes. With a hand blender, food processor or blender - puree the soup and put back in the pan on low heat. Add the cheese, milk and spices and cook until the cheese melts. Serve with crumbled bacon and croutons. This is one of the best fresh cauliflower recipes. It really tastes just like a loaded baked potato. It is also a low carb option. PREHEAT oven to 350 degrees, and grease a medium baking dish. Puree the cauliflower until it has the consistency of mashed potatoes. Set aside. Mix all of the sour cream, half of the onions, half of the cheese, half of the bacon in a bowl. Season with salt and pepper to taste. Stir in the pureed cauliflower and pour into a prepared medium baking dish. Top with the remaining cheese, onions and bacon and bake for 20 minutes. Sprinkle the rest of the green onions over it just before serving. PREHEAT oven to 450 degrees, and grease a medium casserole dish. Trim the cauliflower and separate into florets. Boil in salted water for 10-15 minutes or until tender. Drain and place in the prepared dish. In a saucepan add the milk, flour and butter. Heat and whisk until the mixture boils and becomes thick and smooth. Then simmer for another 2 minutes. Add 3/4 of the cheese and then add the mustard, pinch of nutmeg and salt and pepper to taste. Cook for another minute. 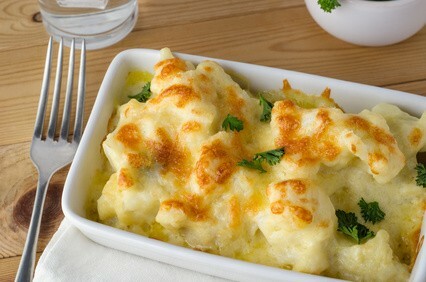 Pour this cheese mixture over the cauliflower and then sprinkle with the remaining cheese and bread crumbs. Bake for 15-25 minutes or until golden brown and bubbling. This cauliflower recipe makes great comfort food. PREHEAT oven to 325 degrees and grease a 2 quart baking dish. Cook the cauliflower until tender. Drain. Now mix the sour cream, cheddar cheese, crumbs, green pepper and onion in with the cooked cauliflower. Pour into the prepared dish. Sprinkle with the parmesan cheese and bake for 30 minutes. PREHEAT oven to 425 degrees and line a cookie sheet with parchment paper for easy cleanup. In a large bowl combine the olive oil and salt and then add the cauliflower and toss until well coated. Place the cauliflower on the cookie sheet and roast for 1 hour - turning 3 to 4 times so the cauliflower is golden brown. The browner the cauliflower is (caramelize) - the sweeter they will be. PREHEAT oven to 450 degrees and spray a cookie sheet with vegetable oil. In a shallow dish combine the cheese, cumin, cayenne, salt and black pepper. First dredge the cauliflower pieces in the beaten egg and then dip in the cheese mixture. Place on the cookie sheet and spray again with vegetable oil. Bake for 15 minutes and place on a serving platter and sprinkle with fresh parsley. Serve with lemon wedges. When you learn how to cook cauliflower in my recipes on this page, this is one that is a keeper. Friends and family will love this. Serve with fresh bread. In a large pot melt the butter and add the onion and garlic and cook until onion is translucent; about 5 minutes. Stir in the potatoes and carrots and cook another five minutes. Pour in the chicken broth and bring to a boil. Add the cauliflower stir and simmer until vegetables are tender; 10-20 minutes. Remove from heat. With a hand blender, food processor or blender puree the soup in batches and return to low heat. Now stir in the milk, salt, pepper and nutmeg. Heat through and serve with cheese on top with the fresh parsley and with garlic bread.